It would take me 10 minutes to drive to Ramsgate. 60 more to complete embarkation and finally I’d have to pay handsomely to endure 4 hours on choppy waters. Why would I want to do this? I wouldn’t. Instead I jumped on the Loop, graciously handed over £1.40 and had my legs under a Belgian table in a fraction of the time. As I sat with a glass of Kriek among the hordes of happy Sunday diners I wondered what to do with the 300 minutes, £40 and sick bag that remained unused in my pocket? The time could be, and was, well spent trying more of the 100 or so Belgian beers offered in this remarkable cafe, with mango eventually proving to be the strong favourite in our higgledy-piggledy booth. The money, a quick glance at the intriguing menu suggested, would cover lunch for me and my three companions, so we ordered an assortment of starters from which the pan-fried scallops with chorizo (£6.00) and the squid in polenta flour with aioli (£3.50) won out. Most of us then went for the roasts (chicken, beef, duck, lamb or pork), which were huge, very well cooked and great value (£6.95). As for the bag it could be quickly recycled to carry home the odd roast potato, chicken leg or Yorkshire pud that escaped demolition at lunchtime. The ramshackle setting adds to the whole charming ‘experience’ you have in this Tardis-like venue. Most of the walls herald art for sale of which much, I’d imagine, will remain so for some time. I can’t say that I met a single Belgian in this artist’s grotto but then if the cafes are all this good in Belgium why would you leave? I wouldn’t. Where would you go in Thanet this weekend if cash and calories weren’t an issue? 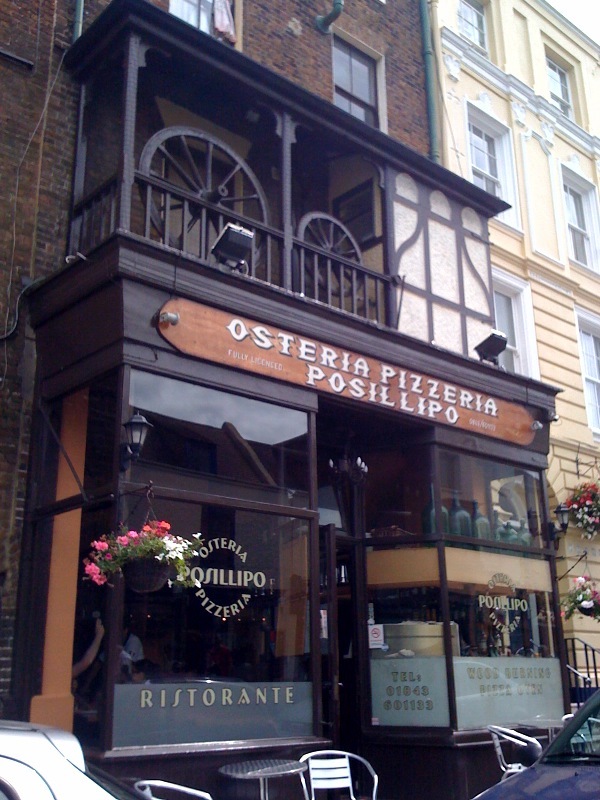 I’d head down to Posillipo’s in Broadstairs on Friday evening for chilled beers, a pizza that could flatten a tenor and a large helping of Neapolitan charm. Saturday morning would be spent reading the papers at Peens whilst I made one of Thanet’s finest breakfasts disappear. Magic. Off to Ramsgate around 1ish to try and solve the amazing Eddie Gilbert’s conundrum. Batter or no batter? What a dilemma. What a decision. What a place. Still no closer to answering this gastronomic riddle I’d cast off in search of my beloved curry – fat nostrils leading me Margatewards. Everybody has his or her favourite spice girl and mine is The Indian Princess. She’s a little too modern for some and a little too expensive for others but I’ll take her as is. On Sunday I’d probably treat myself to a lie in but would rise just in time to order lunch at Age and Sons. I’d spend the afternoon grazing on local produce in an informal setting, happily pickling myself on their remarkable wine list. I’ll leave Sunday night free, however, as there are 13 other Thanet restaurants nominated in the 2009 Kent Restaurant awards that could do with my custom. I won’t be able to visit them all in one evening, so maybe you could instead. Love, apparently, is a two-way street and for the past two years I’ve been unable to reciprocate the pleasure given to me by Posillipo’s. But with this column comes my chance. So here goes. I’ve probably eaten here a dozen or so times and it still makes me smile when they place my pizza in front of me. I’m sure you could spend more at Pizza Hut and certainly not get to enjoy an hour or so gazing out to sea at the defiant, all-weather swimmers. If only they knew how good the food was here they’d be digging trenches up the beach in a rush to get to my table. Though the secret seems to be out, owner Espedito manages to get couples, families, hen-nights and maybe the occasional swimmer into this lively ‘Little slice of Naples’ in Broadstairs. They can all enjoy fabulous pizza for under a tenner, great pasta dishes that cradle the freshest of seafood or a handful of meat and fish dishes that will challenge the hungriest of diners. There’s a specials board too that changes on a regular basis and to start, please do try their garlic bread with mozzarella. It’s just perfect. All of this can be washed down with an Italian beer or wine and you’ll still struggle to spend twenty pounds per person. I should know I’ve tried often enough. I suppose I could do it if I tucked into the puds, but so far I’ve never had the room. Posillipos I love you. 14 Albion Street, Broadstairs, Kent, CT10 1LU, 01843 601133.